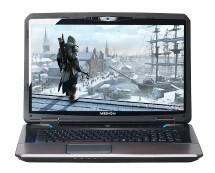 It’s gaming season here at Dealizon UK because hot new high-end gaming laptops just keep on coming. 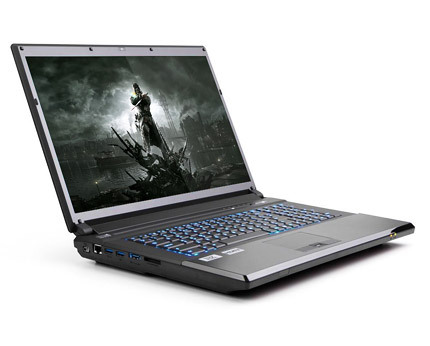 Today’s star is the Novatech Elite N1720, a 17.3-inch Intel Core i7-powered laptop with 16GB of RAM, 1TB mechanical hard drive, 240GB SSD and a monstrous video card – the NVIDIA GeForce GTX 680M. The price tag for this beauty is £1499.99 and you can buy it now from novatech.co.uk. The competition for the “ultimate gaming laptop” title is getting really tight here at Dealizon UK because, just in the last few weeks, we had numerous high-end machines on our hands, each taking a shot at the crown. At this point the battle is between Novatech and Medion, both brands coming with some very competitive products on the table. Novatech held the lead for quite some time with its famous N1716 and N1526 laptops but Medion quickly gained ground, eventually outscoring Novatech with the Medion ERAZER X7821. 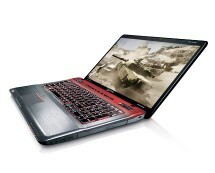 As you may have already guessed, the main battle is held at the GPU level, Novatech taking the red side with the AMD Radeon HD7970 GPU while Medion opted for the green side, going with NVIDIA’s GeForce GTX 680M. Even though the performance difference between the two is not big, winning is winning, and this is exactly what Novatech plans to do with the help of the Elite N1720. In terms of design, the Novatech Elite N1720 is identical to its predecessor, the N1716. Design, texture, ports layout – everything is the same so you won’t be able to tell which is which if you have these two monsters side by side. The laptop is still big and massive but we would have liked to see some changes that really highlight the potential of their laptops in a way an Alienware does. However, the high-quality building materials and features like the illuminated keyboard compensate for this small minus. Since we were speaking of engines, let’s put the N1720’s under our microscope a bit. At the base of the machine lays an Ivy Bridge Intel Core i7 3630QM processor paired with an Intel HM77 Express Chipset. The four memory slots the laptop comes with are all occupied, each of them hosting a 4GB DDR3 memory module, totalling up 16GB of DDR3 memory. On the storage side the Novatech N1720 comes with the already popular two-drive configuration found in most high-end machines: a high capacity mechanical hard drive and a solid state drive for operating system and software; in this case the hard drive is a 1TB Samsung M8 unit and the SSD is a 240GB Intel 520 Series. 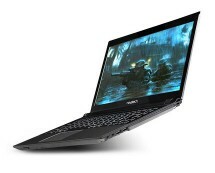 As usual, we’ve left the best for last – the GPU; handling the graphics is the NVIDIA GeForce GTX 680M graphics chip with 2GB of dedicated memory. In the performance segment the Novatech N1720 is at tie with the Medion ERAZER X7821, the former being able to run every game the Medion can in the same conditions with the same results. Out of everything we tested, Metro 2033 was again the only game that wasn’t playable with detail levels set to “ultra high”, everything else running perfectly. Compared to the predecessor, the Novatech N1716, the N1720 is slightly faster in gaming, delivering the same performance in applications; an exception are CAD applications, where N1716 still holds the crown thanks to the Radeon HD7970 GPU which is better optimized towards CAD. Despite the fact that our time with the Novatech Elite N1720 was quite short we had enough time to fall in love with the machine and the reason is simple – it’s good for everything. 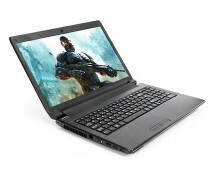 Whether we browsed the web, watched a movie or played a game, the N1720 was simply a step ahead of other laptops. The only downside we could find, again, was battery life, which is a reduced compared to other less-powerful laptops, making the laptop a poor candidate for someone with high mobility needs. OK, so maybe it’s not good for absolutely everything but it’s as close as it can get. This entire review was shaped around the comparison between the Novatech Elite N1720 and the Medion ERAZER X7821 – the rivals for the crown, so it’s time to draw the line and pick the winner. The problem is that it’s a bit hard to do so because, in terms of performance, the two laptops are identical so the only thing that sets them apart is their hardware configuration, where the Novatech N1720 wins the race by a few inches thanks to its more spacious hard drive and solid state drive so, for the moment, the crown of the kingdom of high-end laptops goes back to Novatech. Your move, Medion.